The Alkaline Flask is a portable liquid filtration system that converts drinking tap water into "super-charged" pH & ORP balanced water. The Alkaline Flask is a portable liquid filtration system that converts drinking tap water into "super-charged" pH & ORP balanced water. The "ionized" effect reduces the size of the water molecules making them easily absorbed and distributed through your body. Get energized today and start living life healthier & happier. The Alkaline Energy Bottle is perfectly balance for body & soul! Ionized water can help restore your body's natural pH balance and is quickly absorbed for fast results. Although ionized water is relatively new to North America, Asia has been promoting the many benefits for decades. Super-Charged tap water at the nano level helps your body recover quicker from exercise, boost your immune system & promote weight loss. Over 13 minerals super charge your tap water @ the nano [cellular] level including Tourmaline, Zeolite, Maifanshi Stone and Myuy Jade. These minerals generate negative ions and electrolyze the water destroying free radicals and parasites, help repair damaged cells, fights bacteria and promotes good health. Discover the many benefits you'll feel instantly from the Alkaline Flask. The Alkaline Flask increases the pH levels and lowers the ORP making the filtered water easily absorbed and distributed throughout your body. The water molecules have more surface area giving an "electric" charge that helps hydrate, alkalize and energize at the pH level. Ionized water has claimed to help the cell's self-renewal function, restraining the body's oxygenation and aging. The Alkaline Flask is Guaranteed for 90-days ! 1. Food grade material, safe and healthy. 2. Filtered water for cooking or drinking. 3. Works with gravity to give perfect Filtration performance. 4. Digital indicator shows cartridge life. 5. Increases the alkalinity to make your drinking water more vital. 7. Creates silky-smooth and great tasting water that is Refreshing to drink and cook with. 8. Offers Ph 8.5-10.0 to help support systemic pH balance in the body. 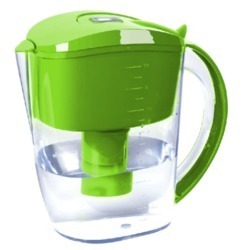 Alkaline water Filter Pitcher:-1.3.5L slim Size. 2. Alkaline (9+ph).3. Antioxidant (ORP-250MV). 4. Small Molecules.5. Hydration or Great tasting.6. Reduces limescale or active Hydration. Alkaline water Filter Pitcher Features:-1. Food grade material, safe and healthy.2. Filtered water for cooking or drinking.3. Works with gravity to give perfect Filtration performance.4. Digital indicator shows cartridge life.5. Increases the alkalinity to make your drinking water more vital.6. Increases active hydrogen.7. Creates silky-smooth and great tasting water that is Refreshing to drink and cook with.8. Offers Ph 8.5-10.0 to help support systemic pH balance in the body. Alkaline water Filter Pitcher:-1.3.5L slim Size.2. Alkaline (9+ph).3. Antioxidant (ORP-250MV).4. Small Molecules.5. Hydration or Great tasting.6. Reduces limescale or active Hydration. Looking for Alkaline Water Jug Importer in India ?